Key pre-match facts, trivia and stats ahead of the 2012 European Championship final between Spain and Italy at Kiev's Olimpiyskyi Stadium. It will be the fourth time a Euro final takes place between teams who met earlier in the tournament. It happened in 1988 (Netherlands-USSR), 1996 (Germany-Czech Republic) & 2004 (Greece-Portugal). Italy and Spain are facing each other for the 31st time in their history. The Italians hold the advantage with 10 wins to Spain’s eight. 12 draws complete the picture. 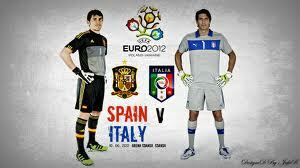 Italy are unbeaten against Spain at major tournaments (penalties shoot-outs excluded), with three wins and four draws. Nevertheless, Spain managed to qualify in their last encounter in knockout games, it was at the quarter-finals of Euro 2008 (0-0 after 120 mins, 4-2 after penalties). Cesare Prandelli has faced Spain twice as Italy head-coach and has never lost. 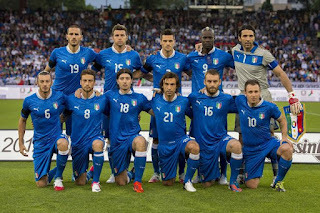 Italy beat them in a friendly in August 2011 (2-1) before drawing in their opening game of Euro 2012 (1-1). Spain haven’t conceded a single goal in their last 900 minutes of action in major tournament knockout games, a streak which started in the quarter finals of Euro 2008. Spain are the second European side to reach the final of three consecutive major tournaments, after West Germany (Euro 72, World Cup 74, Euro 76). Spain could become the first team in history to successfully defend their European Championship title. They would also become the first European side to win three consecutive major tournaments. Spain have won 75% of their finals at major tournaments (three out of four), the best ratio for European sides who have played more than one final alongside France. Italy have reached their ninth final at major tournaments (three at European Championships, six at the World Cup). They’ve won 63%. 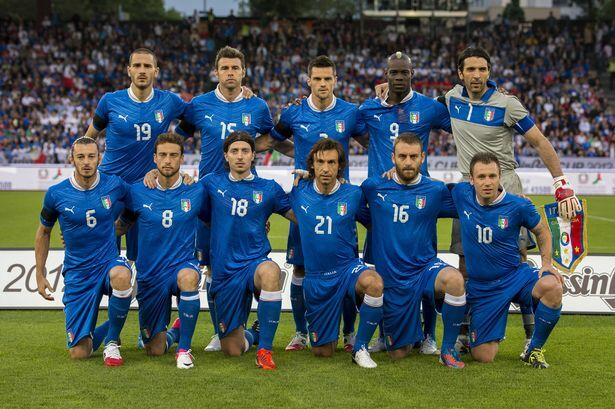 Italy are the only side who have never trailed at any time during Euro 2012. 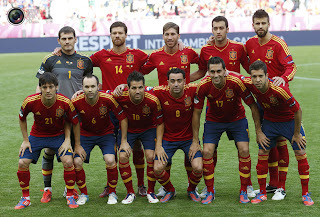 Spain have the best defensive record at Euro 2012 with only one goal conceded. In their last two games combined (quarter-final v France & semi-final v Portugal), Spain have only faced one shot on target. Spain have conceded only 12 shots on target at Euro 2012, 50% of those were against Italy in their opening game (6). Spain have always dominated possession in their seven games at World Cup 2010 and five games at Euro 2012. Germany, in the final of Euro 2008, are the last side to dominate possession against La Roja. Italy and Spain have had the most shots at Euro 2012: 99 and 86 respectively. Italy have picked up the most bookings at Euro 2012: 15. That’s five more than Spain (10). The Azzurri are unbeaten in their 15 competitive games under Cesare Prandelli: 10 wins and five draws. Five Spanish players (Xavi, Xabi Alonso, Sergio Busquets, Andres Iniesta and Sergio Ramos) have completed more passes than Italy’s most prolific player in that department, Andrea Pirlo (320 passes). Mario Balotelli scored as many goals against Germany in the semi-finals as he did in his 12 previous caps for Italy. He’s scored Italy’s last three goals at Euro 2012. Balotelli has had the most shots on target at Euro 2012: 10. Balotelli has become the first Italian player to score three goals in a European Championships tournament. Gianluigi Buffon has played 24 matches at major tournaments, equalling Dino Zoff’s Italian record. He’s still four short of the record holder among goalkeepers, Spain’s Iker Casillas (28). Andres Iniesta is the player who’s had the most shots on target without scoring at the European Championships, since 1980: 11 shots on target, 0 goal. Cesc Fabregas and Santiago Cazorla are the most used substitutes in the history of the European Championships (alongside Holland’s Aron Winter), having been brought on seven times. Spain are bidding to become the first team in history to win three successive major tournaments (Euro 2008, World Cup 2010 and Euro 2012) and the first to retain the Henri Delaunay trophy. La Roja are contesting their fourth European Championship final (1964, 1984, 2008 and 2012). They have lost just one (1984). Vicente del Bosque's side are 19 competitive games without defeat and have won their last nine knockout matches at major tournaments without conceding a goal. However, the Iberian outfit have not registered a competitive win over Italy in nearly a century (with their penalty shoot-out success in the quarter-final of Euro 2008 classed as a draw). Their record in 11 previous meetings is W1, D5, L5, with the sole victory coming in the sides' first ever encounter at the 1920 Olympic games. Italy are competing in their third European Championship final (1968, 2000, 2012). They have won just one (1968). The Azzurri are facing Spain for the 31st time, with their record in prior encounters reading W10, D12, L8. The sides' most recent meeting was in their opening match in this tournament, which finished as a 1-1 draw. Italy have won just two of their last eight matches in regulation time, but are yet to lose a competitive fixture under Cesare Prandelli. With his double against Germany, Mario Balotelli became the first Italian to score three goals at a single European championship. La decisione-Up Post! La tua saggezza accettata è grande. Grazie per tenermi informato. Per ulteriori informazioni, sarò in connessione.